Student chefs from City of Glasgow College and Anne Arundel Community College in the United States went head-to-head in an international live cook-off competition last month. 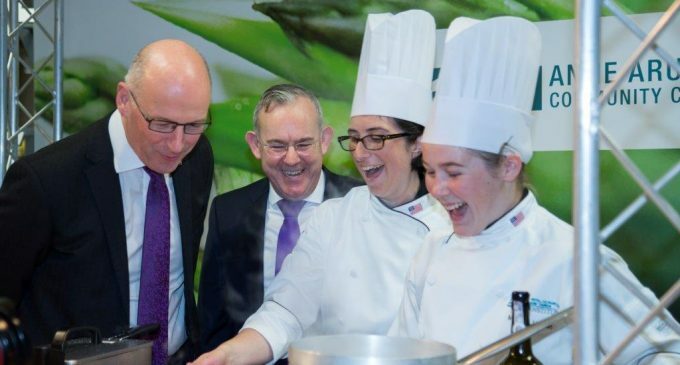 A team of students from City of Glasgow College (some of whom are pictured above with the Scottish Government’s education secretary, John Swinney) competed against culinary arts students from Maryland’s Anne Arundel Community College (AACC) to win a trophy at the gala launch of the new ten-storey Catherdral Street campus on Thursday 27th October. Judged by Brian Maule and Jacqueline O’Donnell, the contest showcased the Glasgow college’s partnership with AACC and marks the completion of its £228m twin-site super-Riverside Campus development. Equipped with 16 kitchens, a fine dining restaurant and a marketplace which is open to the public, it is already widely considered a world-class provider of hospitality training. with frequent wins at high profile competitions and award ceremonies such as WorldSkills and The Craft Guild of Chefs’ Young National Chef of the Year.